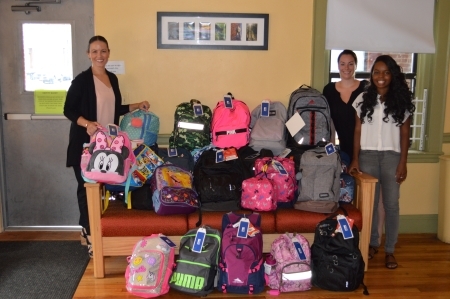 BOSTON – Twenty children served by East Boston’s Crossroads Family Center started the school year with a new backpack full of school supplies and new clothes provided by Massachusetts Port Authority (Massport). This is the 10th year that Massport has partnered with programs in South Boston and East Boston to support families at the start of school year. For more information about Massport’s commitment to its community, visit www.massport.com. Pictured here left to right: Alaina Coppola, Massport’s Assistant Director for Community Relations and Government Affairs and Lauren Antonelli and Dequila Jones from Crossroads Family Center.